This is a sponsored article on behalf of One New Change. One New Change lets you exchange the briefcase for shopping bags, with a mix of fashion, food, accessories and beauty. It’s perfect for a meal with friends or a bit of retail therapy and is open seven days a week. There are high street stores, restaurants and bars whether you want a quick snack on the go, or a long, lazy lunch. One New Change brings artisan businesses together from across London so city shoppers can buy directly from the makers. Food lovers can chat to producers about where their purchases come from and find out how they’re made – a refreshing change from the impersonal experience at the supermarket. Many items sold at the food markets are handmade using seasonal ingredients, so you know that what you buy is truly one of a kind. 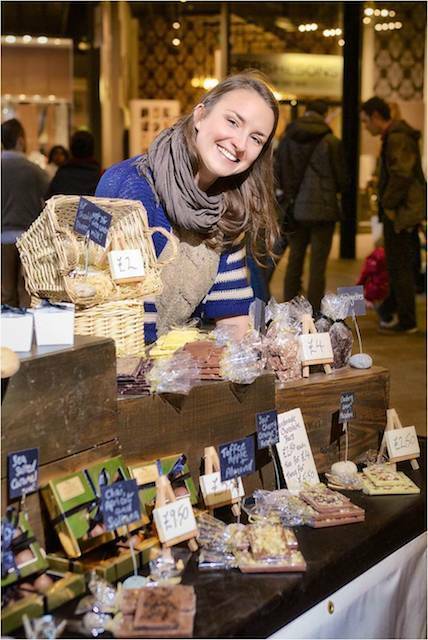 Belinda, owner of Secret Garden Confectionary, is an artisan producer who creates handmade chocolates in her kitchen and sells them at One New Change food markets. Warning, this video contains scenes of delicious chocolateyness. In addition, the sixth floor roof terrace offers great views of the city and beyond, overlooking the historic dome of St. Paul’s Cathedral. One New Change food markets take place on Fridays (9am-3pm), Saturdays (11:30am-5pm) and the first Wednesday of every month (9am-3pm). One New Change and its panoramic roof terrace are open seven days a week with over 60 stores including restaurants, fashion, beauty & accessories. Visit onenewchange.com, facebook.com/onenewchange or twitter.com/One_New_Change for more information.